Christopher Donison's first opera, based on three Jack Hodgins tales, struck a chord with listeners at its Victoria premiere. Eyes on the Mountain was commissioned by the Victoria Conservatory of Music Opera Studio. The opera is based on three short stories by award-winning Vancouver Island writer Jack Hodgins. The stories, Every Day of His Life, Mr. Pernouski's Dream, and Three Women of the Country, are from the author's volumes of short stories Spit Delaney's Island and The Barclay Family Theatre. Set on Vancouver Island, the stories are ineluctably linked to their landscape of sea, coastline, country, woods and mountains. They also reveal an author with a flair for creating telling, humorous detail and captivating characters. In the opera, the stories unfold in a way that brings them into powerful alignment, while at the same time maintaining their autonomy and clarity. Each story has its own version of life's struggle; each is inspired by a sense of place. Together they illuminate our experiences of locality in a transcendent understanding of the shared human experience. The faculty and students of Opera Studio feel privileged to be part of this unique experience to present a new Canadian work, especially one that will have such meaning to local audiences. This new opera by Christopher Donison combines three short stories by Jack Hodgins. Set on Vancouver Island, where the landscape of sea, coastline, country, woods and mountains has as strong a presence as any character, the three separate stories unfold in counterpoint, echoing and contradicting one another. Each story has its own version of life's struggle; each character has his or her own mountain to scale. This is an island where the landscape can bring people together or put them firmly in their place. Every Day of his Life features Big Glad, a single mother of ample girth, and her son Roger. They manage to survive alone in the bush, in their old logging house. She finds company in her abundant supply of dandelion wine and her son's piano playing. Unable to comprehend how anyone would not want to live on this Island Paradise, Mr. Pernouski convinces the Eckharts to inspect several properties he has listed for sale. Mrs. Ekhart thinks the coast is just rain and rude colours. Your greens are too green and your trees are unnatural. She finds Mr. Pernouski infuriating and thinks he could be the devil himself. In one last ditch effort, Mr. Pernouski takes the Ekharts to view a very steep ocean front property. Mrs. Ekhart challenges him to take them down to the beach. Aren't you going to take us down there, down to the beach below, like regular customers? In spite of the risk in doing so (he knows that to descend to the bottom, down there is asking for trouble for someone my size) his obsession overrides good sense. The story called Three Women of the Country centers around the tragic story of Mrs. Starbuck. For 14 years she has kept her son Richard hidden from the world. Her domineering husband wished to have nothing to do with their disabled son and forced her to keep him out of sight, locked away in tool sheds or attics. They moved again and again whenever suspicion arose around the boy. And they always moved at night. We meet Mrs. Starbuck one year after the death of her husband. She has lived in isolated fear and paralyzing indecision. She loves her son, but doesn't know what to do. She is catapulted into action when her neighbour Charlene discovers the boy. Charlene periodically hears noises from the attic of the old farm house and her curiosity is piqued. She sneaks upstairs to find the boy, deaf and disturbed. Richard screams in fear at the intruder. Pandemonium ensues. Mrs. Starbuck realizes she has been too slow to act and is forced to move again. She struggles to get Richard out of the attic and into the car. As she is driving off she loses control, crashes, and is thrown from the car. The boy runs off. The neighbours Charlene and Mrs. Wright hear the accident and come running. As Mrs. Starbuck dies, she confides to the women about the boy and begs them to find him, to give him a chance. They hold her as she dies and assure her that God will know how much she loved her son. Selena James is known across Canada as an eminent voice teacher. Many fine singers, including Richard Margison, Benjamin Butterfield, and Barbara Livingston have studied with her. She received her B.A. and M.A. (Voice Performance) at the Manhattan School of Music, her LRSM from the Royal Academy, England, and an ATCM in piano from the Royal Conservatory, Toronto. Her performing career included leading operatic roles and Broadway musical performances in Europe, USA, and Canada, as well as radio, television and concert performances. Since 1987 she has also been the voice teacher with the Music Theatre program at the Banff School of Fine Arts where she is in particular demand for her ability to develop performers in new works. She has taught at the Victoria Conservatory since 1973, and was Assistant Professor of Voice at the University of Victoria. Ms. James has been with the Opera Studio in her present post since the program started in 1992. Gwen Dobie studied at the Canadian College of Dance in Toronto and is a graduate of the University of Windsor, School of Dramatic Arts, with a major in directing and choreography in theatre and television. In 1992, Ms. Dobie received certification as an Alexander Technique Teacher after three years of study in Tuscany, Italy. Since returning to Canada, she has taught at the Shaw Festival, as well as many music and theatre schools in BC. She also teaches at the Body Learning Centre, and is an instructor of Movement and Alexander Technique for the Victoria Conservatory of Music. During the 1999 session at Opera Studio, Gwen directed Jacques Offenbachs R.S.V.P. Robert is Head of Accompanying at the Victoria Conservatory of Music. He studied under Robin Wood and Winifred Scott Wood and at UBC under Robert Rogers. He has taken accompanying courses and master classes with Gwendolyn Koldofsky, Martin Isepp, Elly Ameling, Rudolf Jansen, Gwen Thompson and Selena James. He has opera experience with Pacific Opera Victoria, UBC Opera Workshop and VCM Opera Studio. Robert has performed throughout Canada, USA, England, and New Zealand and on CBC Radio as accompanist and chamber player. He has been a prizewinner in competitions in Toronto and Colorado. He is Chorus-Master and Repetiteur for Pacific Opera Victoria, where he has recently become head of the Education Program. He is a frequent musical director at the University of Victorias Phoenix Theatre. Mr. Holliston has an international concert career as a soloist, an accompanist, and a member of the recording salon-ensemble Viveza. He has worked with some of todays most loved artists, including Judith Forst, Crista Ludwig, Richard Margison, Leopold Simoneau, Maureen Forrester and prima ballerina Karen Kain. Margaret has worked in stage management and set design with many theatre groups in Victoria. She is a graduate of Victoria College of Art and is a working artist. She has also worked as a florist, lifeguard, mom, and receptionist. Margaret has worked with Langham Theatre, Stages Productions, the Gilbert and Sullivan Society, William Head on Stage, and the Island Repertory Company. She worked with Opera Studio on Gianni Schicchi. Rooted in ten years of studies in saxophone, Giuseppe Pietraroia's formal training in music culminated in 1992 when he received a Master's degree in orchestral conducting from McGill University as a student of Timothy Vernon. His other teachers have included Gustav Meier, Kirk Muspratt, and Paul Vermel. From 1997 to 1999 Mr. Pietraroia was Music Director of the West Island Youth Symphony Orchestra in Montreal and was appointed Visiting Assistant Professor at Plattsburgh State University, New York. He has served as assistant conductor for the 1996 production of Faust by Opera Lyra in Ottawa as well as several Pacific Opera Victoria productions including A Masked Ball, Tosca, Werther, and The Barber of Seville. Mr Pietraroia is currently the staff Conductor of the McGill University Symphony Orchestra. Peter studied at the College of Fine Arts in Bratislava, Slovakia. After coming to Canada, he began working at the Capitol Theatre in Nelson, BC, where he designed, built, and painted sets and produced lighting designs for productions of Hair, Cabaret, Joseph and the Amazing Technicolor Dream Coat, Westside Story, and more. Since arriving in Victoria, Peter has designed the set and lighting for Langham Court Theatre's production Of Mice and Men. He has also worked as a prop builder for Pacific Opera's production of Erewhon and as a fireworks prop builder and pyrotechnician at Butchart Gardens. Bill recently graduated from the University of Victoria's Theatre Department. All the disciplines of theatre interest him greatly. He currently writes and directs for the interpretive program at the McLean Mill National Historic Site. He is also involved in forming a local theatre-in-education troupe. Roberta is the resident designer at the Chemainus Theatre Company. She also instructs and facilitates costume design, construction, and stage makeup on the Island and lower mainland. Eyes on the Mountain is Roberta's eleventh production with Opera Studio. Ken Lavigne (Mr. Pernouski) A native of BC, Ken studied at the University of Victoria with Susan Young and has continued his studies at the Conservatory with Selena James. In 1998 he gave his debut performance as Schmidt in Massenet's Werther with Pacific Opera Victoria. He has sung the tenor solos of Handel's Messiah with the Victoria Symphony and is presently an active member of the Young Associate's Program with the Portland Oregon Opera Company. He performed the role of Rinuccio in Opera Studio's production of Gianni Schicchi and is scheduled to perform the role of Abdallo in Pacific Opera Victoria's April 2001 production of Nabucco. Ian Funk (Mr. Swingler) Ian received his B.Mus. from the University of Victoria. He studied with Judith Dowling, Alexandra Browning, and Lois Watson and is presently studying with Selena James. He studied art song, opera, and music theatre at the Banff Centre for the Arts. He has been a recitalist and soloist with Pacific Opera Victoria, Vancouver Opera, Victoria Symphony, University of Victoria Chorus and Orchestra, Queen of Puddings Music Theatre Company, and Autumn Leaf Performance. He has been a vocal/dialogue coach and assistant director with VCM's Opera Studio. Dino Antoniou (Mr. Pernouski's son) Dino has studied voice at the Victoria Conservatory of Music since 1997 and under Selena James since 1999. He has performed in several Opera Studio productions, including The Beggar's Opera, Gianni Schicchi, and Prince Orlofsky's Victorian Soirée. He was a chorus member in Pacific Opera's productions of A Masked Ball, Don Giovanni, and Rigoletto. Erin Bardua (Big Glad) Erin currently studies voice with Karen Smith at the Victoria Conservatory of Music. She has also studied opera and song at the Banff Centre for the Arts and the NUOVA Summer Intensive in Edmonton. Past Opera Studio performances include Rosalinde in Prince Orlofsky's Victorian Soirée and Polly Peachum in The Beggar's Opera. She has also performed with the Gilbert and Sullivan Society and the Victoria Operatic Society. She will play the role of Anna in Pacific Opera Victoria's April 2001 production of Nabucco. Dexter Bligh (Roger) Dexter has just turned 11 years old and attends South Park School where he sings in the school choir. He has studied music under Marnie Sinclair, and Irene Fast and worked with Gwen Dobie on school productions Wings Through Time and Alice in Wonderland. For the past four years he has studied Jazz and Funk dance with Stages Dance and has been involved in their annual performances at the Royal and McPherson Theatres. Cam Culham (Mr. Eckhart) Cam is currently completing his M.A. inTheatre at the University of Victoria, where he also teaches English as a Second Language. He also works at St. Michael's University School as a house parent for International students. He sings in the Victoria Conservatory of Music ensemble Tonus Peregrinus. Eve-Lyn de la Haye (Charlene) Eve-Lyn is in her third year of post-secondary studies at the Victoria Conservatory of Music and is a voice student of Selena James. Having studied music and dance since early childhood, Eve-Lyn's love for stage has led her to numerous appearances in opera, oratorio, and solo recitals. Her roles have included Sister Genevieve in Puccini's Suor Angelica and Suky Tawdry in Opera Studio's production of John Gay's The Beggar's Opera. Carolyn Howe (Mrs. Eckhart) A native of Victoria, Carolyn has studied under Ruth Kyle, Karen Smith, Susan Young, and Arlene McIntyre. In July 2000 she had the opportunity to study at Vienna Meisterkurse under the direction of Edith Wiens. Carolyn won the Rose Bowl and the Norma Douglas Scholarship Award in the 2000 Greater Victoria Performing Arts Festival. She has performed with the University of Victoria Chorus, Cowichan Consort, The Courtney Youth Music Camp, and the Linden Singers. She sang Papagena in Opera Studio's 1995 production of The Magic Flute. Jared Hynnes (Mr. Pernouski's understudy) Jared began his musical studies in Thunder Bay where he studied with Evelyne Reid and was active in high school productions and music festivals. On entering Lakehead University Jared decided to pursue classical singing on a professional level. He has studied with Mark Pedrotti and Paul Coates and has performed in master classes for Ingemar Korjus, Rosemarie Landry, and Douglas Bodle. Jared recently relocated to British Columbia in order to study with Selena James. He performed Eisenstein in Opera Studio's December 2000 production featuring excerpts from Die Fledermaus. Katie Knapp (Mrs. Starbuck) Katie is from Gilford, Ontario, and is in her third year as a vocal performance major, studying with Alexandra Browning-Moore at the University of Victoria. She has been alto soloist in performances of the Mozart Requiem and Handel's Messiah. Most recently she played the role of Dido in the University vocal department's production of Dido and Aeneas. Jack Hodgins lives on Vancouver Island where he teaches fiction writing at the University of Victoria. His works have won the Governor General's Award, Gibson's First Novel Award, Eaton's BC Book Award, the Commonwealth Literature Prize (regional), the Canada-Australia Prize, the Ethel Wilson Fiction Award, and the Drummer General's Award. Born in 1938, Jack Hodgins grew up in the small logging community of Merville in the Comox Valley on Vancouver Island. Much of his fiction is set on Vancouver Island. His first book, the collection of stories Spit Delaney's Island, was nominated for the 1976 Governor General's Award, and "did for the people of Vancouver Island what ... William Faulkner [did] for the American south." (The Montreal Gazette). After graduating from the University of British Columbia, Hodgins taught high school English in Nanaimo for some twenty years. He also spent time as a writer in residence at Simon Fraser University and the University of Ottawa. Since 1983 he has been on faculty at the University of Victoria, where he teaches Creative Writing. 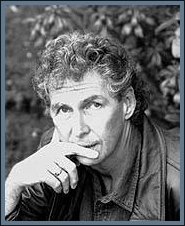 His second novel, The Resurrection of Joseph Bourne, won the 1979 Governor General's Literary Award for English Language Fiction and confirmed Hodgins as one of the most important new Canadian writers of the 1970s. Hodgins' works include the two story collections Spit Delaney's Island and The Barclay Family Theatre, from which the stories for Eyes on the Mountain are drawn. He has written six novels: The Invention of the World, The Resurrection of Joseph Bourne, The Honourary Patron, Innocent Cities, The Macken Charm, and Broken Ground. His other works include Left Behind in Squabble Bay, a children's novel, Over Forty in Broken Hill, a book about his travels in Australia, and a guide to writing fiction called A Passion for Narrative . He has also written radio plays, which have been produced by the CBC. In 1995 he received an honorary D.Litt. from the University of British Columbia for bringing renown to the university and the province as one of Canada's finest fiction writers and as an innovative stylist and distinguished academic. In 1998 he was given an honourary D.Litt by Malaspina University-College. In 1999 he was elected to the Academy of Humanities and Social Sciences of the Royal Society of Canada. The citation from the Royal Society says, For over twenty years, John Stanley (Jack) Hodgins, Department of Creative Writing, University of Victoria, has been an outstanding Canadian novelist. His work has given voice and imaginative shape to a whole region. Robert Kroetsch writes that Hodgins "put Vancouver Island on the fictional map of Canada as it had never been done before." Simultaneously, Hodgins situated his work within the context of "magic realism," blending the local and the fantastic, the historical and the mythological. He has also served the cause of Canadian culture by his work abroad in promoting the study and appreciation of our literature, as well as being, here in Canada, an influential teacher of young writers. Hodgins' renown has indeed spread far beyond Canada. Some of his stories and novels have been translated into other languages, including Dutch, Hungarian, Japanese, German, Russian, Italian, Polish, and Norwegian. Several are taught in European universities. A number of scholars in Canada and in Europe have published critical studies of his work. He has given talks or read from his work in a number of countries, including Japan, Austria, Finland, Sweden, Norway, the US, and New Zealand. In 1996 he was one of ten Canadian writers invited by the French Minister of Culture to be honoured at Les Belles Etrangères, a biannual festival devoted to foreign literature in translation. 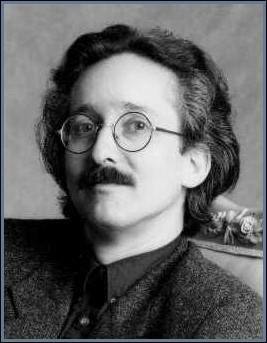 In June of 1997 he taught a fiction-writing workshop in Marburg, Germany. In November of that year he was a guest at an academic conference on Literatures of the Islands, at the University of Strasbourg, France. In 2000 he was keynote speaker at the annual conference of Australian teachers of writing. Currently, Jack Hodgins is working on a new novel, a collection of stories, and a screenplay based upon Spit Delaney's Island. Composer, conductor, pianist, lecturer and inventor, Christopher Donison studied piano with Winifred Scott Wood at the Victoria Conservatory of Music in the 1970's. He remembers the Conservatory's early opera workshops in the living room at Craigdarroch Castle; now, many years later, he is the composer of the first original opera commissioned by the Conservatory's Opera Studio. He is impressed with the high quality of music training and the hope and devotion that have led from those beginnings to this exciting project. Christopher graduated from the University of Victoria with a Piano Performance major. He went on to win a Dora Mavor Moore Award for Music Direction in Toronto and to serve as Music Director of the Shaw Festival in Niagara-On-the-Lake for ten years from 1988 to 1998. There he conducted over 1000 performances, created a string quartet residency program, and wrote more than a dozen scores for plays and orchestrations for many more. Christopher continued to pursue graduate studies in composition at State University of New York in Buffalo. He has composed choral, chamber, and orchestral works. In 1998, to mark the centenary of George Gershwin's birth, he completed an unfinished Gershwin musical for the Estate of George and Ira Gershwin	. In January 1999 he appeared as guest conductor with the Kingston Symphony where he premiered his own first symphony: Symphony Erotica. Other concert works include 7 Encounters for Soprano and Flute; the award winning Choral Prophecy, which was performed by the Choir of Clare College, Cambridge, England, on their first North American tour; Theme and Conversations for Orchestra; and The Little Match Girl for Orchestra, Narrator, and Dancer, which was choreographed, adapted, and narrated by Veronica Tennant. He has also composed a quintet, Music-by-the-Sea, for clarinet and string quartet, and two string quartets, The Rashomon Quartet and The Seagull Quartet for string quartet and distant oboe. Christopher is also the inventor of the Donison-Steinbuhler Keyboard, a smaller 7/8 alternative piano keyboard that serves those with smaller hands. An octave on a DS keyboard is approximately equal to a seventh on the conventional keyboard. He is hoping this keyboard will become universally available for study, competition, and performance within a generation to help eliminate the discrimination exerted upon the smaller half of the world by a one-size-fits-all standard that favours the larger half. Prototypes of the DS keyboard have been donated to several institutions, including the Victoria Conservatory of Music, the University of Victoria, and the Banff School of Fine Arts. If a piece of new music does not connect with a contemporary audience, it is very convenient for its creator to claim immunity from public acceptance in the name of fidelity to artistic integrity and the knowledge that great work must of necessity be so far ahead of its time that it will not be understood. But there has been such a wholesale rejection of new classical music in my lifetime that I cannot help but think it is not all the audience's fault. There is a widening gap between the praxis (the study) of music and the culture. This has occurred because we (in the new-music world) have mis-identified the most important ingredients in the creative process itself. We replaced talent with intelligence, and we have valued originality above all, instead of inspiration. There is much complaint that some new music is over-intellectualized. I don't think that it is possible for music to be over-intellectualized, but it is very often under-intuited or under-inspired. Intuition has not been embraced as an equal partner with intelligence in the creative process. Although composers in our time have been successful in not looking over their shoulders to commercial interests in creating their art, they have not been able to stop looking over their shoulders at their peer group. I believe this is the reason that the gap has developed. They have avoided writing down to the public but have not avoided writing up to themselves. In writing Eyes on the Mountain I adopted the position that anybody walking by the theatre that might be dragged in to hear this opera should be able to understand and enjoy it. Opera's roots are bourgeois. I tried to create music that captured not only the essence of the stories, but also the sense of place in which they were created. It is music of this Island, and it has melodies and motifs and colour and rhythm, but it is classical music, and that means it is not just of this Island. It is music of modest complexity to perform, but easy to connect with. It has many traditional elements and yet is current. My goal is to make music that is inevitable but unpredictable. My inspiration was to make an opera from Jack Hodgins' compelling stories that was of and for the people of this Island — for all to enjoy and reflect upon. Over the past nine months I have come to know intimately all the characters of this opera. Jack Hodgins' books traveled in my backpack last summer as my daughter and I toured Italy and Corsica. Oddly, we kept encountering Jack's characters on trains and boats: in the gypsy who insisted on drawing our portraits, in the fanatically passionate coconut salesman on the beach yelling "Cocco bello! ", in the fiercely protective mamma, hiding her child from the sun and the wind and the sand. I came to understand that Jack's characters could be found everywhere. His stories of isolation, love, loss, hope and failure are universal. But, could we take these short stories and create an opera? How do we preserve the deep and real humanity of the characters? Can we maintain the integrity of such rich and complex stories while facing the technical challenges? Are the Opera Studio participants ready? It was a great pleasure to meet the characters musically in Christopher Donison's score for Eyes on the Mountain. Clear and precise in their characterization, his lovely melodies sing in my mind day and night. I have become as passionately obsessed with this opera as Mr. Pernouski is about selling real estate. I look around Vancouver Island with as much pride and wonder as Big Glad. My daughter hears me singing endlessly about jam and wonders if I will ever get around to making some. The Opera Studio participants have been incredibly brave, tirelessly enthusiastic and fiercely dedicated. Thanks to them for their faith and fearlessness (one singer said ruefully to me, "Usually the composer is dead and we don't have to watch him wince when we don't get it right!") It has been an honour working with Christopher Donison and Jack Hodgins. They have been constantly supportive of the entire Conservatory community. At this project came together, the words of W.H. Murray resonated with me. Until one is committed, there is hesitancy, the chance to draw back, always ineffectiveness. Concerning all acts of initiative (and creation) there is one elementary truth, the ignorance of which kills countless ideas and splendid plans: that the moment one definitely commits oneself, then providence moves too. All sorts of things occur to help one that would never otherwise have occurred. A whole stream of events issues from the decision, raising in one's favour all manner of unforeseen incidents and meetings and material assistance, which no person could have dreamed would have come one's way. There has been complete commitment to this project. I hope you enjoy Eyes on the Mountain. Classical music during much of the twentieth century earned a reputation for being "difficult" — a reputation not entirely undeserved. Audiences have often felt alienated, as if composers were creating music for each other — theoretical, cerebral, obscure music that bypassed the interests of the listener altogether. 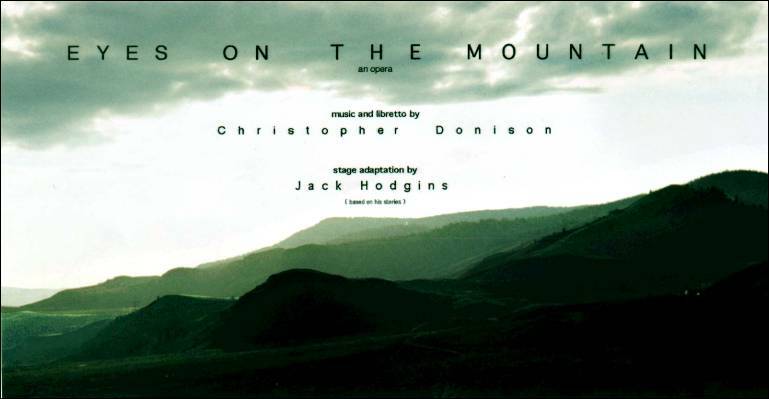 Eyes of the Mountain, a new opera with music and libretto by accomplished composer and former VCM student Christopher Donison after stories by Jack Hodgins, one of Canada's finest writers, may properly be considered a twenty-first-century opera. Although Donison is certainly a contemporary composer, with a unique and personal voice, he is clearly aware of the great tradition of music theatre. His music serves the text well, is gratefully written for the voice, and (this is the difficult part) manages to suggest to the listener what the characters may be feeling and thinking behind the words. By creating memorable (and hummable) melodies for each of the characters in this complex drama, Donison has given them all a distinct musical personality. Yet when all the characters are singing together, the tunes work together to produce a satifying ensemble. Christopher's many years as music director at the Shaw Festival have given him a theatrical canniness that too many aspiring opera composers lack. His musical choices have the same quirky yet utterly persuasive rightness that we find in the works of Stephen Sondheim. It has, as always, been a privilege and an inspiration to work under the guidance of our Artistic Director, Selena James - after many years of working with new operas at the Banff Centre, Selena is uniquely qualified to be our leader. Our Stage Director, Gwen Dobie combines saneness and creativity in a way I had not previously thought possible. Throughout this process, Gwen and Selena have consistently demonstrated insight, understanding, skill, and utter professionalism. In Joey Pietraroia we have a conductor who is always clear, always helpful, and always kind. The cast, orchestra, and design team combine students with professionals and those who are on the cusp of professionalism. We hope that our work on this wonderful new opera will satisfy its composer, Christopher Donison, and the man who created the Vancouver Island characters, Jack Hodgins. We hope that our students have benefited from the long and sometimes arduous rehearsal process. But above all, we hope that our audience enjoys the evening. because that's why we do what we do. Hodgins ... is bemused and pleased to find his plain-spoken Vancouver Islanders reincarnated on the opera stage. Donison is working closely with the author, whose chief concern is that his characters retain their earthy authenticity. "It was very important to me that they seem like Vancouver Island people ... I didn't want them to suddenly start talking as though they were members of the Toronto aristocracy." For Donison, the central challenge is creating distinct music and words for each of the three stories.... Each tale has its own sound, its own rhythms and its own narrative, yet somehow all three must resonate with each other. "I tell ya, that's no easy thing. It's like a monstrous Rubik's Cube...."
Director Gwen Dobie says a few students were initially apprehensive about performing a new opera, fearing atonalities and a dearth of melodies. Instead ... they were greeted with "beautiful, beautiful stuff" that sometimes sends shivers up her spine. Shelagh Rogers spoke with Christopher Donison and Jack Hodgins on March 29, 2001, on CBC Radio's This Morning. To read excerpts or to listen to the complete interview, see New opera set on Vancouver Island debuts. The deceptively simple music is accessible, melodic and often gorgeous ... Appropriately, each of the three yarns has its own distinctive sound. The Big Glad story commences with a nostalgic, warmly autumnal sound that caresses the listener. The music that accompanies Mr. Pernouski's insistent sales pitches is serpentine and hypnotic with burgeoning, swelling strings. Meanwhile, Three Women of the Country starts with purposeful unison quarter-notes, suggesting an unrelenting deliberation as the tale progresses to a tragic conclusion. The music seems simple, with the orchestra typically hugging the melodic arcs of the arias closely. If one listens closely, though, the orchestration is quite complex. Donison regularly introduces subtle twists and turns, such as a cluster of clarinet notes in the overture held aloft like a floating bird. There's much cleverness in the intertwining of the stories that eventually occurs.... This musical and theatrical counterpoint is very successful; resonating and echoing wonderfully. A revolving set depicting curving rock and a cabin, squeezed onto the Alix Goolden's small stage, is first-rate. Having created an opera that was both intelligent and moving, it seems Donison's reason and inspiration were operating at full throttle. and many individual donors and volunteers. 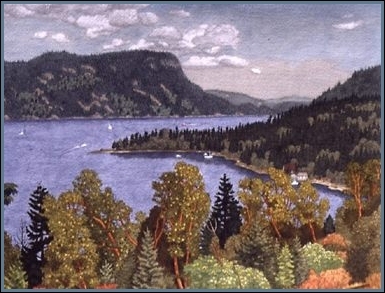 Use of the painting Above Maple Bay in the promotion of this opera was generously donated by E.J. Hughes. On right, MLA Gretchen Brewin presents a cheque from The British Columbia 2000 Millennium Arts and Heritage Fund for the Opera Studio Eyes on the Mountain project. 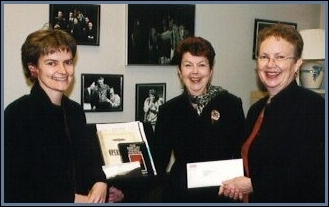 From left to right, Victoria Conservatory of Music Director Linda Bottomley, Opera Studio Artistic Director Selena James, and the Honourable Gretchen Brewin, MLA.